Like pecan pies with built-in portion control. Soften the butter and cheese. Blend in half the flour at a time and salt. Shape pastry into two 2″ diameter rolls; wrap and chill overnight. Slice the pastry into 36 portions. Press into 2″ muffin pans. Line the cups; do not make rims. Place half the nuts in lined cups. Using a rotary beater, gradually add sugar to the eggs. Add butter, salt and vanilla. Pour into tart shells. Sprinkle with remaining nuts. Bake at 350 degrees about 20 minutes. Makes 3 dozen. 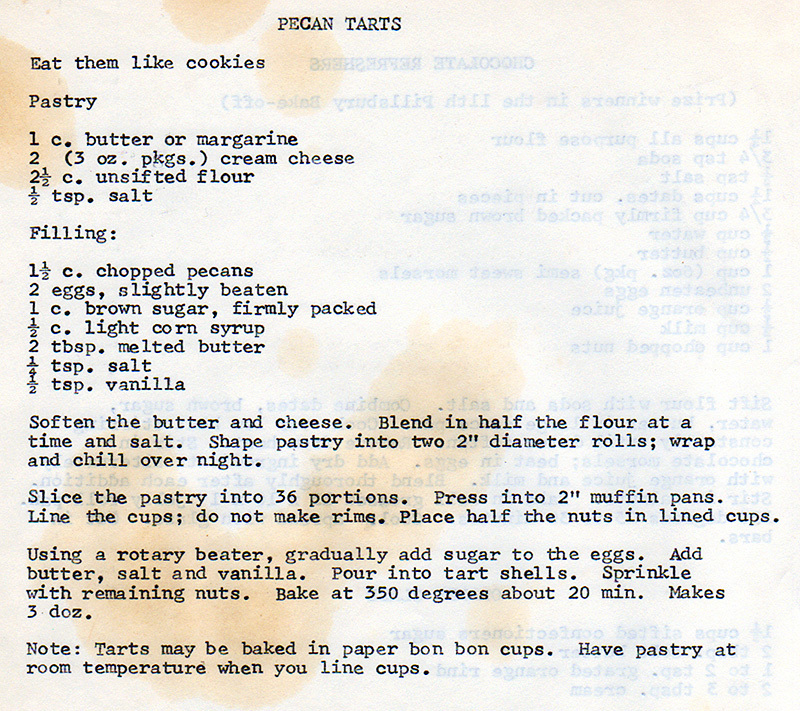 Note: tarts may be baked in paper bon bon cups. Have pastry at room temperature when you line cups.